All our products are either shipped via Amazon (when ordered on an Amazon.com site) or by Express Mail Service (EMS). When you order an item from us that isn't fulfilled by Amazon, we will contact you with an ID code that you can use to track your package. We always ship via express mail service (EMS) within 3 business days following the receipt of an order. For most locations in North America, delivery typically takes between 3-5 days. Unfortunately, delivery to APO mailboxes is not supported. We like to provide as much value as possible, which is why we offer free shipping via express mail service (EMS) to North and Central America from Japan. Delivery to other countries may be available as well. Please check Japan Post's website for a list of supported countries. We only accept payments via PayPal, which allows you to either pay via a PayPal account or by credit card. Not every country is supported by PayPal, however. A list of supported countries is available on PayPal's website. Please contact us if you have any questions. If you select the Buy It Now option, immediate payment will be required. After payment has been confirmed, we will begin processing your shipment - a process that typically takes 1 day to complete. We accept returns within thirty (30) days of the purchase date provided that the original product seal has not been broken. We ask that you contact us prior to returning any item and explain the circumstances to a customer service representative, who will give you a number to place on the outside of the package. If you return a product to us, you will be the exporter from the destination country. Title and risk of loss transfer to us upon our receipt of the merchandise. Shipping carriers will assist you in recovering your taxes and duties for a fee. Please contact shipping carriers directly to initiate this service. Once we have received the item, we will notify you and promptly ship the product in exchange via express mail (EMS). Delivery typically takes between 3-5 days to most locations. Unless indicated otherwise, import duties, taxes and charges are not included in the item price or shipping charges. These charges are the buyer's responsibility. 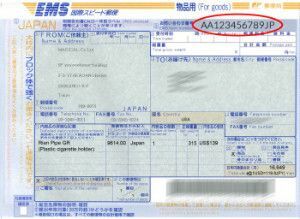 Prior to purchase, please check with your country's customs office to determine what additional costs may arise. Any item mailed to Canada is potentially subject to duty and taxes. Although the Goods and services tax (GST) was designed as a tax on the consumption of goods and services within Canada, imported goods are also subject to the GST because this ensures fair tax treatment for domestic products. Therefore, unless specifically exempted, you must pay the 5% GST on items you import into Canada by mail. If you live in New Brunswick, Newfoundland and Labrador or Nova Scotia, you must pay the 13% harmonized sales tax (HST) on items you import into Canada by mail. If you live in another province or territory, you may be responsible for paying a Goods and Services Tax (GST) of 5%. If you live in British Columbia, Manitoba, Ontario, Quebec or Saskatchewan, you must pay the applicable rate of sales tax for the province in which the goods are delivered. Should you have other questions or concerns about these privacy policies, please email us at mcs(@)magical-online.com or contact us via the Contact page. "Rien Pipe" is a registered trademark of Magical Inc. To the extent a name or logo does not appear on this website does not constitute a waiver of any and all intellectual property rights that Magical Inc. or its subsidiaries has established in any of its product or service names or logos. Magical and its business partners collect information about you by using cookies, tracking pixels and other technologies. We use this information to better understand, customize and improve user experience with our websites, services and offerings as well as to manage our advertising. For example, we use web analytics services that leverage these tools to help us to understand how visitors engage with and navigate this site, such as how and when pages in a site are visited and by how many visitors. We are also able to offer our visitors a more customized, relevant experience on our sites using these tools by delivering content and functionality based on your preferences and interests. Protecting the privacy of the very young is especially important. For that reason, we never collect or maintain information at our website from those we actually know are under the age of 20, and no part of our website is structured to attract anyone under 20. Should you have other questions or concerns about these privacy policies, please email us at mcs [at] magical-online.com or contact us via the Contact page.